LimeWire is very nice and useful Peer-To-Peer filesharing application. LimeWire Basic can be freely downloaded from http://www.limewire.com. LimeWire sources available from http://www.limewire.org under GPL. Why you like LimeWire so much? LimeWire runs on Gnutella p2p network. Gnutella is the popular, growing, fully decentralized network based on open standards. I believe, Gnutella is superior for any other p2p networks such as FastTrack, eDonkey, OpenNap, etc. 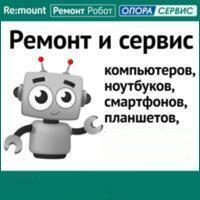 LimeWire itself have rich and useful interface which makes search and download easy, handy and fast. 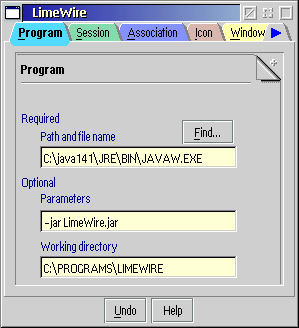 Also, LimeWire is written in Java, and can run under any operating system which have JVM version 1.3 or higher. LimeWire's download page doesn't contain OS/2 (or FreeBSD) version. Which version I should download? But wait, read OS/2 JVM notes! At present, under OS/2 we have 3 JVM which can run LimeWire. Let's to describe each version. This version of JVM is very stable, fast and works perfectly. However, last version 1.4.1_07 is not free. It available for purchase from http://www.goldencode.com. Previous version 1.4.1_06 was free, and I still use it. It works very well, except for small interface glitch - if you minimize and then restore LimeWire - search panel will be maximized and you need drag splitbar with mouse to right place. It's a bug of original Sun JVM 1.4.1 and it was successfully ported to OS/2 ;-). This is original Sun JVM for Windows modified in order to run under OS/2 using Innotek Runtime (custom build of Odin Project). Generally, it works well, but some users experienced GUI "hiccups" and, sometimes, hangs. It's free and available from http://www.innotek.de. To create a WPS object, drag Program Template from Templates folder to Desktop. In "Path and file name" type path to you javaw.exe. In "Parameters" - "-jar LimeWire.jar". And "Working directory" - folder where you have LimeWire installed. 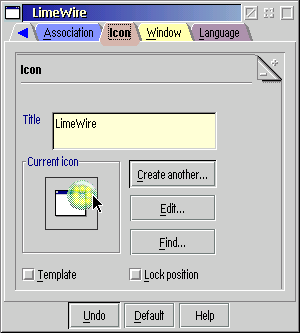 At "Icon" tab enter object title: "LimeWire". Icon in OS/2 format can be downloaded here. If you firewalled and use NAT, and if you are owner of your firewall - you can make LimeWire perform better. Configure you firewall to enable portmap (port 6346, TCP and UDP) from external IP to you internal LimeWire PC. In LimeWire settings, "Firewall" section, check on "Force IP". Now LimeWire will accept incoming connections and can download/upload from/to other firewalled users. Change "192.168.1.10" to real IP of your PC. If you setup working, you will see local IPs in search results (displayed in red). I heard about Gnutella2 p2p network. Will LimeWire supports Gnutella2 protocol? No. Gnutella2 is not a Gnutella protocol. Gnutella2 creators name it as "Gnutella" just for self-promotion. Gnutella2 not have advantages over Gnutella. You can read more here. BitTorrent is new and popular download (only download, not serach) protocol. LimeWire team have plans to support BitTorrent in LimeWire (planned in version 4.4/4.5 or so). You can find unofficial version with BitTorrent support here. Some my friends reports about small number of search results for rare files when OOB Searching enabled. When OOB Searching is disabled, more results can be found (especially for rare files). I recommend disable OOB Searching. 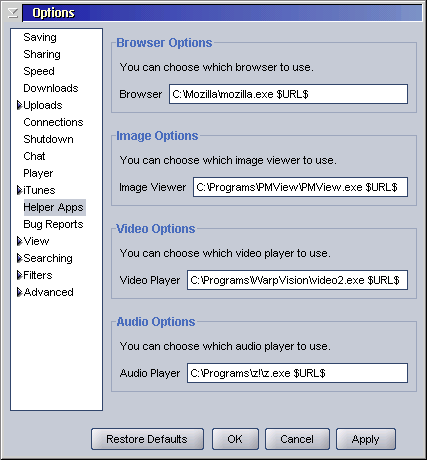 Go to LimeWire options dialog and in "Speed" section remove check from "Enable OOB Searching" checkbox. I'm strongly recommend use latest version of TCP/IP stack. Install TCP/IP version 4.3x and update it with fixpack WR08708. Note that version 4.4.5 is now out and that the Limewire.COM site now lists OS/2 under other OSes. Java version 1.4.2_05 from Sun Microsystems Inc.
to Bart: looks like you got corrupted files. Download and unpack again from scratch. Getting OS/2 mentioned was a small effort. A promise to by the pro version did the trick !! This article has rediscvered Limewire to me. Now with 4.6 it's running fine. Two questions: with the LimewireOther files all is running, but you think it's interesting to merge with other distributions? It's possible to get rid of the offer to download a not working Pro version in our system? 2. There it's no a Limewire Pro for our system (or I'm wrong?) so we don't need to say 'later' every time we run Limwire. It's there a cure for this? even if the cure needs to by Pro version/2 would be fine. 1. Merge? What you mean? Finally, we got separate package which can be unpacked under os/2 without problem. It's good. unabl to logon. how do retrive loss information? Limewire does not start. I downloaded LimeWireOther.zip, but it says main class not found. The readme says Java 142 is sufficient, but not for me. Older version from Hobbes runs but will not connect. Tried Virtual PC and Windows version of limewire runs fine, so it's not my network setup, I think.